A blood cancer diagnosis typically leads one to an oncologist or hematologist, a cancer center and a conversation about available treatment options. One option that is not always presented is that of being part of a research study. Clinical trials are carefully controlled studies of new or existing drugs, conducted by doctors. Researchers are trying to find ways to increase the effectiveness or decrease the side effects of treatment. A treatment that is proven safe and effective in a clinical trial often goes on to be approved by the U.S. Food and Drug Administration (FDA). This is how new lifesaving treatments are brought to market. Through participation in a clinical trial, a patient can gain early access to an experimental therapy that may be more effective than standard treatments. Trials may also provide an alternative for someone unable to undergo a recommended procedure (such as a transplant). The decision to enter a clinical trial must take into account the effectiveness/safety of approved (standard) products as well as the risks and possible benefits associated with the treatment being tested. For example, if the standard treatment is always effective and has few side effects, there would be little reason to consider a clinical trial. On the other hand, if available treatments offer a low chance of success and/or are highly toxic, a clinical trial may be an option to consider. While it may be challenging to sort through these issues and identify appropriate trials to pursue, considering the options is part of a carefully considered treatment plan. Fewer than 5 percent of patients with cancer participate in clinical trials. Part of the reason may be due to the fact that physicians often don’t talk about clinical trials with their patients. One study in New England showed that only 44 percent of eligible patients were even told about a trial. Only 20 percent of patients eligible for Phase 2 and 3 trials were offered enrollment, yet most who were offered enrollment participated. Reasons for a lack of referrals are varied but often it’s just that many physicians don’t have the time needed to make sure patients understand the risks and benefits of participation. This is where The Leukemia & Lymphoma Society can come in – as something of a “physician extender.” Almost half of the callers who reached out to LLS’s Clinical Trial Services over the past two years ended up entering a trial. Information Resource Center specialists provide individualized help to patients interested in a trial. They obtain information about the patient’s diagnosis, medical and treatment history, physical condition, financial situation and need for support services, willingness and ability to travel away from their local area for treatment, and most importantly, their understanding of the potential risks and benefits associated with trial participation. Using this information, a trial search is conducted and a list of possibilities created. Patients are advised to explore the options presented with their doctor. If needed, LLS can connect a research team directly with the patient to determine whether a particular trial is an option. Clinical trials involve four phases. In Phase 1, researchers test a drug on a small group of people to evaluate safety and determine the appropriate dose. Phase 2 involves using a larger group of patients to see how well it works while continuing to evaluate safety. Phase 3 trials usually compare the outcome of a group of patients receiving standard treatment to a similar group receiving the experimental treatment. Placebos are used in extremely rare situations (such as when the standard treatment is ‘no treatment’). Participants are always told when a placebo may be a part of the study. Phase 4 trials are studies of approved drugs that continue to monitor safety and effectiveness with long-term use, or in specific populations. 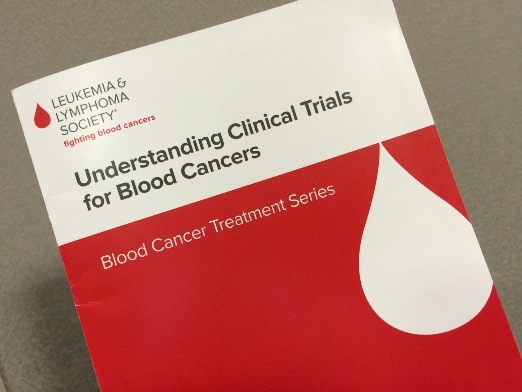 Visit LLS's clinical trials page to learn more about whether a trial is an option for you, what participating involves, and how to find one. Contact our Information Resource Center at (800) 955-4572 and be referred to one of our clinical trial specialists.